A slot game that truly is out of this world is now at your fingertips after it’s highly anticipated release in June 2018. The game is anything but ordinary for WS, so if you are looking for a video slot game that is unique, innovative and exciting, you can’t go wrong with Astro Legends: Lyra and Erion. The intergalactic game will transport you to an alternative universe where Lyra, a cool, slick and stunning frontwoman with an amazing purple afro and electric guitar will guide you through the strange new planet. Get your groove on in deep space with this exciting video slot game. 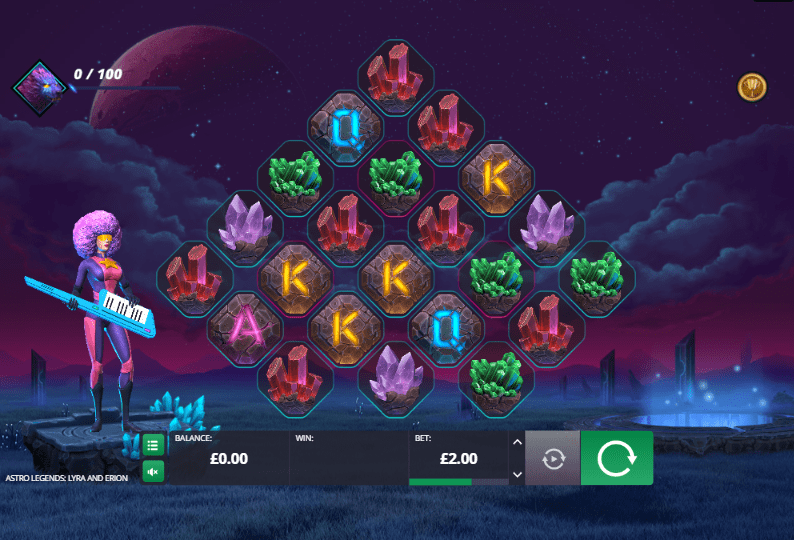 Astro Legends: Lyra and Erion is unique in its layout and resembles a diamond shape rather than the conventional square-shaped reels slot games. The clustered reels comprise high paying, colourful gemstones in addition to lower paying card symbols traditionally featured in slot games. 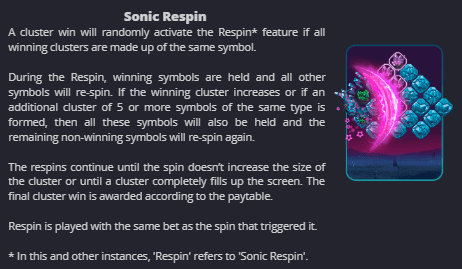 A unique feature to the game is that the symbols ‘pop up’ on the reels and do not spin like a traditional reel, so it will be a welcomed refreshing change to a conventional slot game. Explore the space when you try one of the best 3D slots today! Keep your eyes peeled for the Wild Multiplier symbol which is the pink gemstone which will substitute all other symbols and will also help you along the way by multiplying your winnings by either 2 x, 3 x, 4 x or 5 x in the process. Throughout the game you will be fuelled by stardust as the stardust meter above the reels fills up, keep your eye on this meter as a lucrative stardust bubble could appear at random on the reels and Lyra may kindly burst the bubble and grant you some prizes. Once you have 100 points you will trigger the Lyra Spirit Bonus feature where you will be transported to a different screen where you will meet three racing tracks with Lyra’s spirit animal the majestic wolf ready to win some points in the 7 rounds of the game within the game. There are a multitude of other features including re-spins and Pick Me bonus features which will give you the opportunity to multiply your stake, so this groovy slot is certainly worth a spin. This game is not only lucrative, unique and ingeniously designed, it is also visually stunning. The game’s colours are beautiful and vivid, with electric blues and purples dominating the reels to give an otherworldly look and feel. The background of the reels will leave you captivated as it unveils a planet scene with misty mountains and thick mysterious blue clouds and twinkling stars which gather around the unique reels. Or if you are feeling Christmassy, then you may want to check out Jingle Bells.